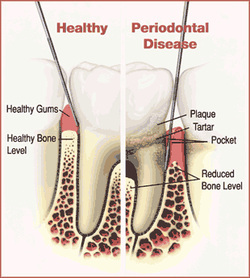 Periodontitis is a chronic bacterial gum infection that directs the immune system to destroy the attachment fibers and supporting bone that hold teeth in place. These bacteria, as well as their toxins form "pockets" around the teeth a space between the gum and root surface. Over time, these pockets become deeper, providing more space for pathologic bacteria to live and advance under the gum tissue. Eventually, if too much gum and bone is lost, the teeth become excessively loose and may need to be extracted. When pockets are too deep to clean with daily at-home oral hygiene and a professional care routine, Dr. Ford may recommend a pocket reduction procedure. During this procedure, Dr. Ford folds back the gum tissue and removes the disease-causing bacteria before re-securing the tissue into place. In some cases, irregular surfaces of the damaged bone are smoothed to limit areas where disease-causing bacteria can thrive. This allows the gum tissue to better reattach to healthy bone. Reducing pocket depth and eliminating existing bacteria are important to prevent damage caused by the progression of periodontal disease and to help you maintain a healthy attractive smile. Eliminating bacteria alone may not be sufficient to prevent disease recurrence. Reduced pockets with a combination of daily oral hygiene and professional maintenance care increase your chances of keeping your natural teeth – and decrease the chance of other serious health problems associated with periodontal disease.